New York, June 28, 2016 — Hon. 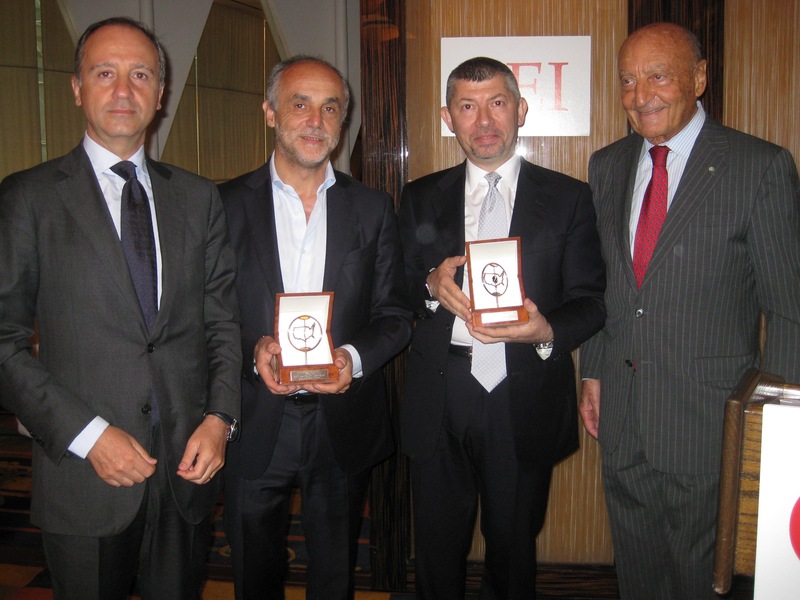 Ivan Scalfarotto, the new Undersecretary at the Ministry of Economic Development, and Michele Scannavini, the new President of ICE-Italian Trade Agency, received today the “GEI FRIENDSHIP AWARDS” from GEI President Lucio Caputo. The ceremony was held during a GEI Breakfast in their honor in the private room of Le Cirque restaurant, with a capacity audience of GEI members, VIP, Italian and American authorities and press. In his introduction, Dr. Caputo illustrated the career and the accomplishments of the two awardees, underlining the significant roles that they have received in an important sector of the Italian economy and commerce. In their speeches, Hon. Scalfarotto illustrated the present Italian political situation and the activities that the Government is presently conducting, and President Scannavini detailed the various actions that ICE-Italian Trade Agency will take in support of Italian exports. Good morning, ladies and gentlemen. Today I am very pleased to welcome to New York and to GEI, the new Undersecretary of State at the Ministry of Economic Development, Hon. Ivan Scalfarotto. I am also pleased to welcome the new President of ICE – Italian Trade Agency, Michele Scannavini. On behalf of GEI, please accept our congratulations on your appointments and our thanks for joining us this morning. After graduating with honors in Law from the University of Naples, Hon. Scalfarotto spent 20 years in management positions for Italian and international banks in the Human Resources field. Between 2002 and 2009, he lived and worked abroad, first in London and then in Moscow. In 2007 he joined the “Democratici di Sinistra.” He was elected to the Constituent Assembly and appointed to the Commission charged with drafting the new party’s statute. In October 2009, he was re-elected to the National Assembly, of which he was elected vice president. In March 2013, he was elected to the Chamber of Deputies. In February 2014, Hon. Scalfarotto was appointed Undersecretary of the Ministry of Reforms and Relations with Parliament in the Renzi government. In 2010, he founded “Parks – Liberi e Uguali,” a non-profit organization of businesses committed to implementing equal opportunity policies for their LGBT employees, and to creating a culture of inclusion and respect for all in the workplace. He was Secretary of State to the Prime Minister from February 2014 to April 2016, when he was appointed Undersecretary at the Ministry of Economic Development. I am, therefore, very pleased – on behalf of GEI, – to present Hon. Ivan Scalfarotto with “GEI FRIENDSHIP AWARD,” wishing him the best success in his new position. We are equally pleased and honored to have the presence of President Michele Scannavini, whose impressive business career in both Italy and the United States is well-known. President Scannavini graduated in Business management at Bocconi University in Milan in 1984. From 1984 to 1990, he served as Brand Manager at Proctor and Gamble, then was Marketing Director at Galvani, before becoming Vice President of Marketing and Sales at Ferrari in 1992. From 1992 to 2002, he was CEO of Fila, and then in 2002, began his decade-long presidency at COTY Prestige. Under his leadership, net revenues and profit materially increased. He went on to serve as CEO of COTY from 2012 to 2014. He then served as Board Director and Business Advisor at Tod’s, and was Member of the Investment Committee for E’ Novia. On June 1, 2016, Italy’s Council of Ministers selected Michele Scannavini as President of Agenzia ICE. I am, therefore, very pleased – on behalf of GEI, – to present President Michele Scannavini with “GEI FRIENDSHIP AWARD,” wishing him the best success in his new position.